The word ‘Capitol’ is an abbreviation of the two words Capitoline Hill – the smallest of the 7 hills and apparently the one on which Rome was meant to have been built. The Capitol was the political centre of the giant empire. On the Capitol there was the temple of Jupiter – the king of all gods in Roman mythology. Important state acts were carried out on the ‘Capitol’ Square that lay in front of it. It also served as an end point for victory parades that e.g. were held when a general victoriously ended a war and brought the war booty and numerous prisoners back to Rome. After the conquest of Rome by Alaric in 410 and the subsequent gradual downfall of the metropolis, the Capitol also declined. The once magnificent stately buildings were partly used as quarries including the construction of churches. This decline was only brought to an end at the beginning of the modern era. Today the Capitol is home to two major tourist attractions - the Capitalonian Museums. They were opened in 1734 by Pope Clement XII and were the first public museums in the world. The collection grew over time and contains many valuable paintings from famous artists like Tizian, Bellini and Caravaggio in addition to such world famous sculptures like the ‘Capitalonian Venus’ or the ‘Dying Gaul’. The bronze statue of the Emperor Marcus Aurelius is also exhibited in the museum. The statue on the square in front of the museum is merely a replica. 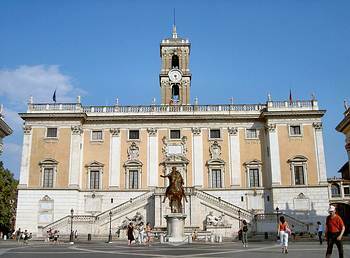 This square – the Piazza di Campidoglio is the other tourist attraction. It was designed by no other than the great Michelangelo himself, and was designed to create a fitting setting for the above mentioned equestrian statue of Emperor Marcus Aurelius. One enters the square via a grand staircase with wide steps – the Cordonata. Directly opposite the Cordonata, Michelangelo had the Senator’s Palace built. Rome’s city government is now found there. To the left of the square is the ‘Palazzo dei Conservatori’ and opposite is the ‘Palazzo Nuovo’. The Capitalonian Museums are housed in both of these buildings. There is a fountain in front of the Senator’s Palace. The Capitalonian Museums can be reached using the Bus – numbers 44, 63 and 70, bus stop Piazza Venezia.